Joara was a large Native American settlement, a regional chiefdom of the Mississippian culture, located in what is now Burke County, North Carolina, about 300 miles in the interior in the foothills of the Blue Ridge Mountains. Joara is notable as a significant archaeological and historic site. It was a place of encounter in 1540 between the Mississippian people and the party of Spanish conquistador Hernando De Soto. A later expedition under Juan Pardo in 1567 created the first brief European settlement in the interior of the continent, establishing Fort San Juan at this site, together with other forts to the west. It is thought to be the first and the largest of the forts that Pardo established in an attempt to colonize the American South On July 22, 2013, archeologists announced evidence of the long-suspected Fort San Juan at Joara, after previous excavations revealed European as well as Mississippian artifacts. In the 21st century, archaeological finds from excavations have established evidence of both substantial Mississippian and sustained Spanish 16th-century settlement in the interior of North Carolina. Joara was also the site of Fort San Juan, established by the Juan Pardo expedition as the earliest Spanish outpost (1567–1568) in the interior of what is now North Carolina. This was 40 years before the English settlement at Jamestown and nearly 20 years before their "Lost Colony" at Roanoke Island. 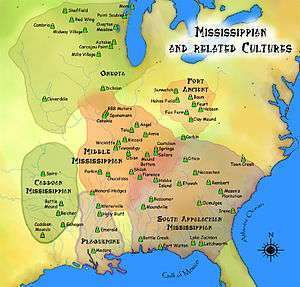 Established about AD 1000, Joara was the largest Mississippian culture settlement within the current boundaries of North Carolina. In 1540 a party of Spanish conquistador Hernando De Soto encountered the people at this chiefdom site. It was still thriving in January 1567 when the Spanish soldiers under Captain Juan Pardo arrived. Pardo established a base there for the winter, called the settlement Cuenca, and built Fort San Juan. After 18 months, the natives killed the soldiers at the fort and burned the structures down. That same year the natives destroyed all six forts in the southeast interior and killed all but one of the 120 men Pardo had stationed in them. As a result, the Spanish ended their colonizing effort in the southeastern interior. Joara is thought to have been settled some time after AD 1000 by the Mississippian culture, which built an earthwork mound at the site. It was a regional chiefdom, established on the west bank of Upper Creek and within sight of Table Rock, a dominant geographical feature of the area. The Joara natives comprised the eastern extent of Mississippian Mound Builder culture, which was centered in the Mississippi and Ohio river valleys. By the time of the first European contact by the Spanish with Native Americans in the foothills of the southern Appalachians, Joara had already grown to be the largest Mississippian-culture settlement in present-day North Carolina. The town served as the political center of a regional chiefdom that controlled many of the surrounding native settlements. Most contemporary scholars, following John Swanton, connect the various spellings of Joara with the Cheraw, a Siouan language-speaking people. The later historic Catawba Nation are likely descendants of the natives at Joara. Cofitachequi and the neighboring Coosa chiefdoms were developed by ancestral Muskogean-speaking groups, who apparently claimed other areas as tributary. The Creek people are their descendants. The scholar T.H. Lewis at first associated the term Xualla with the modern Qualla Boundary and thought it was Cherokee, but most modern scholars no longer believe this. Charles Hudson alone among modern scholars argues that Joara may be a Cherokee name; but the Cherokee were not moundbuilders and were not the first to develop the site. In 1540, Hernando de Soto led a Spanish army up the eastern edge of the Appalachian mountains through present-day Georgia, South Carolina and North Carolina. 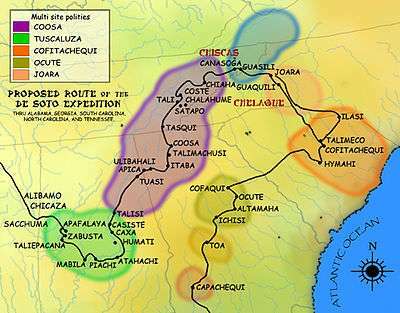 This expedition recorded the first European contact with the people of Joara, which de Soto's chroniclers called Xuala. De Soto brought the queen of Cofitachequi province to Joara as an involuntary member of his entourage. The chroniclers also state that the queen claimed political dominion at this time over Joara province as well as the province of "Chalaque", and that the natives in both places respected her office. She managed to escape after reaching Joara. On December 1, 1566, Captain Juan Pardo and 125 men departed from Santa Elena, a center of Spanish Florida (located on present-day Parris Island, Beaufort County, South Carolina) under orders from Governor Pedro Menéndez de Avilés to claim the interior for Spain. Pardo was to pacify the native inhabitants, convert them to Catholicism, and establish a route to Spanish silver mines near Zacatecas, Mexico. The Spanish thought they were much closer to the mines than they were in fact. Shortly after May 1568, news reached Santa Elena that the native population had burned the six Spanish forts established by Juan Pardo and killed all but one of the 120 Spanish men stationed in those garrisons. Captain Pardo never returned to the area, and Spain ended all attempts to conquer and colonize the southeastern interior. Captain Juan Pardo's narrative of his travels and settlement at Joara, written by his scribe Bandera, were discovered and translated into English in the 1980s. They have contributed to a significant reassessment of the history of Spanish colonization in the interior of North America. Although the location of Joara and Fort San Juan were forgotten, local inhabitants found numerous native artifacts in certain areas of the upper Catawba River Valley. Unlike areas in which mounds were protected, during the early 1950s farmers bulldozed Joara's twelve-foot-high earthen platform mound to make way for cultivation. The location of the mound is now recognizable only as a two-foot rise in the field but current owners vow to protect the site. In 1986, a breakthrough occurred at the Berry excavation site (named for the family who own the property). Archaeologists discovered 16th-century Spanish artifacts. This evidence, supported by Bandera's 16th century narrative, caused a reevaluation of Pardo's route through the Upper Catawba Valley. Further evidence suggests the Berry Site is the location of Joara and Fort San Juan. The archaeological site has demonstrated the extent to which the Spanish attempted to establish a colonial foothold in the interior of the Southeast. Further excavations at the Berry site throughout the 1990s and 2000s have yielded remains of native Joara settlement and burned Spanish huts, and more 16th-century Spanish artifacts, including olive jar fragments, a spike, and a knife. In 2007, the team excavated Structure 5 and found a Spanish iron scale, as well as evidence of Spanish building techniques. These artifacts were not trade goods but objects used by the Spanish in settlements. Joara is particularly interesting for the interaction between Native Americans and Spanish, who were relatively few in number and depended on the natives for food. Archaeologists expect to find evidence that will reveal more about events there. Archaeologists familiar with the area have concluded this is the site of Joara and Fort San Juan. It supports documented Spanish settlement of 1567–1568, as well as the natives' burning of the fort. The discovery is requiring a reassessment of the history of European contact with Native Americans. In July 2013, archeologists reported finding evidence of the remains of the fort itself at the site, including the remnants of burned palisades and what appeared to be the main structure within the fort. ↑ Charles Hudson, The Juan Pardo Expeditions: Explorations of the Carolinas and Tennessee, 1566–1568 (Tuscaloosa, Ala.: University of Alabama Press, 2005), 25.